The Casertana breed has very ancient origins (Teano or Pelatella): in fact it is frequently represented in frescoes and sculptures of Roman times. It is certainly the most precocious among Italian breeds, being able to give large amounts of fat. 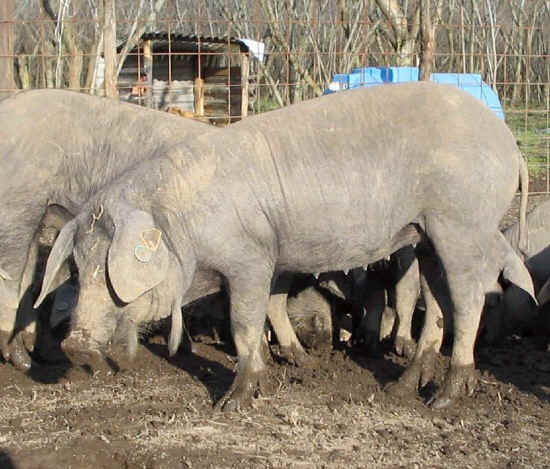 At the age of one year these pigs may weigh over 150 kg. The present situation about this breed is crucial, as only few examples still live, and not all of them are full-blooded. Rustic, excellent at grazing, frugal and precocious, they have all the right features to be raised in the open. Their fertility is limited to an average of 4-6 piglets each delivery up to a maximum of 10. Bristles are absent or present in reduced number, that is why the nickname of Pelatella. Another distinctive element is the presence of two lacinias (jowls) under the neck. The head is small with medium-sized parallel ears, which they bear forward. The frontal nose profile is straight or just hollow. Short solid limbs and a light skeleton. The colour is dark often getting to purple brown.